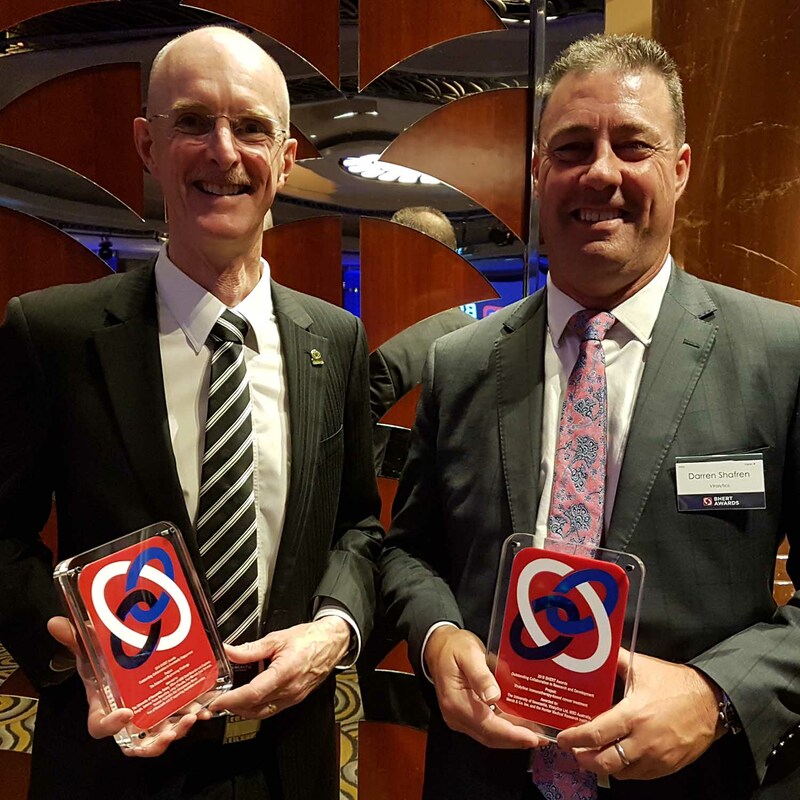 Two projects, one led by Professor Darren Shafren and another led by Dr Terry Burns, were recognised for demonstrating high impact at the prestigious Business/Higher Education Round Table (BHERT) Awards held last night in Melbourne. Now in their 20th year, the Awards reinforce the important role business and university partnerships play in driving innovation, research and teaching developments across the country. Recognising one of the largest biotech transactions in Australian history, Professor Shafren received the Outstanding Collaboration in Research and Development Award for his investigational anti-cancer therapy, CAVATAKâ. Professor Shafren’s ground-breaking discovery of using a virus associated with the common cold to infect and kill cancer cells was acquired earlier this year by the world-leading pharmaceutical company MSD (tradename of Merck & Co., Inc., Kenilworth, N.J. USA) for AU$502 million. Now 20 years in the making following seed funding from Greater Bank and with ongoing support from the Hunter Medical Research Institute (HMRI*), CAVATAK has progressed successfully with limited side effects through Phase 1 and Phase 2 clinical trials in melanoma and other cancer indications. Established in the year 2000 as a capacity building outreach program to inspire primary and high school students to engage in science, technology, engineering and mathematics (STEM) subjects, the Science and Engineering Challenge (SEC) received the Outstanding Collaboration in Community Engagement Award. Dr Burns said the Science and Engineering Challenge is the typical Australian quiet achiever that has worked with a diverse range of partners around the country to become one of the longest-running and most successful STEM engagement programs, reaching almost 50,000 people every year. “We’ve been working hard for almost two decades to inspire the next generation of STEM professionals, but we haven’t been doing it alone. We work together with local communities, businesses, professional groups and other universities to achieve mutually beneficial goals that none of us could accomplish by ourselves,” Dr Burns said.